Cheddar Oyster Crackers for sale. Buy online at Zingerman's Mail Order. Gourmet Gifts. Food Gifts. When I was a waiter, I ate a lot of packets of hexagon shaped, plain crackers when tips were scarce. They didn’t taste like much more than salt, but they were a good enough snack. 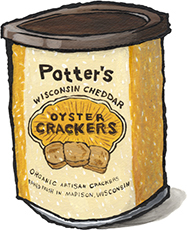 Now Potter’s, the organic cracker maker of Madison, Wisconsin, has redefined the lowly but loved oyster cracker. Tawny from baking in small batches, these little rounded rectangles are made with Wisconsin cheddar cheese and a touch of spice from a bit of Cayenne pepper. They're toasty, just cheesy enough, and that spicy kick slowly builds to a gentle warmth. They’d be great in soups or salads, but I’m just guessing on that. I ate the whole tin without testing their versatility. Some habits die hard.